You will find below the horoscope of Trista Rehn with her interactive chart, an excerpt of her astrological portrait and her planetary dominants. Horoscopes having the same aspect Sun sextile Jupiter (orb 0°59'): Elvis Presley, Benedict Cumberbatch, Isaac Newton, Bradley Cooper, James Franco, Courtney Love, Alexander the Great, River Phoenix, Lorde, Claudia Schiffer, Vivien Leigh, Hugh Hefner... Find all the celebrities having this aspect. Horoscopes having the same aspect Mars conjunction Uranus (orb 1°43'): Johnny Depp, Rihanna, Robin Williams, Robert Downey Jr., Joaquin Phoenix, Françoise Hardy, Vincent Cassel, Sarah Jessica Parker, Alain Juppé, Ava Gardner, Jimmy Page, Usher (entertainer)... Find all the celebrities having this aspect. Celebrities clicked on in real-time: 577,286,119 times. Trista Nicole Sutter (née Rehn) (born October 28, 1972 in Indianapolis, Indiana, USA (birth time source: Astrodatabank)) is a prominent former participant in the ABC reality television shows, The Bachelor (in which she was runner-up to Amanda Marsh) and The Bachelorette. As part of her participation in The Bachelorette, Sutter was paid $1 million by ABC for affording the network the right to televise her December 6, 2003 marriage to Ryan Sutter, the bachelor she selected to marry on the show. The televised wedding, broadcast as the finale of a three-episode special Trista & Ryan's Wedding drew over 26 million viewers, making it one of the most-widely viewed episodes in the history of reality television. Here are some character traits from Trista Rehn's birth chart. This description is far from being comprehensive but it can shed light on his/her personality, which is still interesting for professional astrologers or astrology lovers. 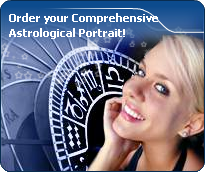 In a matter of minutes, you can get at your email address your astrological portrait (approximately 32 pages), a much more comprehensive report than this portrait of Trista Rehn. Trista Rehn, the diurnal South-eastern quadrant, consisting of the 10th, 11th and 12th houses, prevails in your chart: assertion and goals achievement are at the centre of your concerns. You are very keen to implement your dreams and your plans. You achieve your ambitions as soon as possible, whether through an active social life, highly charged friendly relations, or an urge to take actions in order to reap - in the eyes of the world, of course - the rewards of your dynamism. It is likely that spirituality or humanitarian actions are part of your motivations, sometimes at the price of some degree of isolation. The predominance of Water signs indicates high sensitivity and elevation through feelings, Trista Rehn. Your heart and your emotions are your driving forces, and you can't do anything on Earth if you don't feel a strong affective charge (as a matter of fact, the word "feeling" is essential in your psychology). You need to love in order to understand, and to feel in order to take action, to the detriment of a certain vulnerability against which you should learn to fight. Like the majority of Earth signs, Trista Rehn, you are efficient, concrete and not too emotional. What matters to you is what you see: you judge the tree by its fruits. Your ideas keep changing, words disappear, but actions and their consequences are visible and remain. Express your sensitivity, even if it means revealing your vulnerability. Emotions, energy and communication must not be neglected; concrete action is meaningless if it is not justified by your heart, your intellect or your enthusiasm. Fire's qualities are not very present in your chart, with only 3.48% instead of the average 25%, which means that you may lack warmth, enthusiasm, conquering spirit, or energy. You may look indifferent to others, with almost no desire, no joy of life or no enterprising ability. Actually, it is not true, but you should let go, force yourself to be more daring, and show your amazement as well as your vitality. You certainly have as much energy as others, you just need to release it, and it is up to you to display more of it, since it will be all to your benefit: shout, sing, pull faces, dance! That's the right mean for you... In the end, you'll never be accused of being sad, phlegmatic or a killjoy! Trista Rehn, the Cardinal mode is dominant here and indicates a predisposition to action, and more exactly, to impulsion and to undertake: you are very keen to implement the plans you have in mind, to get things going and to create them. This is the most important aspect that inspires enthusiasm and adrenalin in you, without which you can grow weary rapidly. You are individualistic (maybe too much?) and assertive. You let others strengthen and improve the constructions which you built with fervour. Cadent houses, namely the 3rd, 6th, 9th and 12th houses, are very emphasized in your chart, Trista Rehn. They indicate important potential for communication, adaptability and flexibility. These houses are symbolically linked to the mind and intellect. The relative weakness implied by these characteristics indicates your tendency to hesitate or to be indecisive, but also your remarkable ability to start off again, which is a nice quality, finally: you can easily get yourself out of a tight spot thanks to your mobility and casualness, in the best sense of the term. This group of houses corresponds to evolutionary characteristics of your personality. However, they are only indications and you must include them in the rest of your chart in order to see whether they are validated or not! After this paragraph about dominant planets, of Trista Rehn, here are the character traits that you must read more carefully than the previous texts since they are very specific: the texts about dominant planets only give background information about the personality and remain quite general: they emphasize or, on the contrary, mitigate different particularities or facets of a personality. A human being is a complex whole and only bodies of texts can attempt to successfully figure out all the finer points. Affectivity and intuition are very developed, Trista Rehn, and you are very sensitive to your environment. You “feel” atmospheres, moods and other people's emotions and when you capture negative influences, a feeling of ill-being immediately overwhelms you, all the more so because your lively imagination may destabilize you as it amplifies your receptiveness. Your nature is anxious and you tend to worry for your entourage. You strive to offer them a reassuring family atmosphere, the much needed comforting and warm sort of cocoon where you can laze around, at will. Because you care so much for your family, they may think that you are intrusive and that you try to rule their life through subtle affective blackmail. Trust them... and also learn to have more confidence in yourself! You are the very type of the researcher endowed with great intellectual and imaginative capacities, Trista Rehn, and your curiosity is very deep. Researches, riddles and mysteries appeal to you and with a remarkable sixth sense and intuition, you endlessly try to unearth the truth, in all areas, like a psychoanalyst or a detective. You are a very secretive and introverted person, you find it difficult to open up and you rather prefer psychoanalysis. In spite of your clear-sightedness, you find it hard to deal with people: your critical mind, tinted with irony and causticity, may be destructive, especially since your determination and your stubbornness do not incline you to giving up. You are fond of provocations and you handle contradictions skilfully even though you may come across as dishonest. Trista Rehn, inside yourself, feelings are strong and powerful. However, you never show them before weighing up and considering all the possible consequences of your words and your actions: fieriness and spontaneousness are toned down because you cannot help controlling yourself, probably due to your modesty, your discretion or your shyness; you are frightened because you are so concerned with other people's opinion that you see passion, or expressing your feelings too quickly, as sources of danger. However, you are helpful, simple, and you do not fuss around. Reason prevails in your love life but your heart may flare up when the context is well organized and everyday life is cautiously handled with good sense, tidiness and cleanliness. Your sensitivity prompts you to avoid excesses and outbursts and this is how you think that you can achieve happiness without risk. The ruler of the Ascendant, Trista Rehn, is Saturn. In the sign of Gemini, it endows you with flexibility and the capacity to undertake several things simultaneously, sometimes at the risk of spreading yourself too thing and getting discouraged. Your innate communication skills match your insatiable curiosity for people and for things. No one can say that you are particularly aggressive, Trista Rehn! Actually, it takes a great deal for you to become able to express your anger because you belong to the wavering type and you are not prone to risk-taking; you loathe violence and you would rather not intervene than start a conflict. Moderation and the happy medium in all things are your favourites. One of the only areas that makes you wage war is injustice, whether you are the one who is stricken or whether it is someone who is helpless. In this particular field, as in that of sexuality, you are not impulsive and you appreciate it very much when your partner shows the way, preferably with much serenity and gentleness. Actually, the form and characteristics of your sexuality depend on the rest of your personality. This text is only an excerpt from of Trista Rehn's portrait. We hope that it will arouse your curiosity, and that it will prompt you to deepen your knowledge of astrology, as well as to visit and use the wide range of free applications at www.astrotheme.com.